The biggest hurdle for the box canyon continues to be access. Snow shoes are the still a necessary piece of equipment. Once down to the river the fishing has been great. We have had great success swinging streamers and fishing rubber legs. As far as streamers go a good color selection is the key. Regardless of the pattern you use make sure you have multiple colors. Also slow down the presentation. 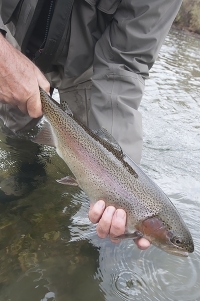 In this cold water trout aren’t as likely to chase down your streamer as they are in the summer time. I would make sure to have #10 black rubbers legs and the usual collection of zebra midges. #16 and #18s. I would have zebras in brown, red and black. Keep a sharp eye out for spawning beds and of course don’t walk through these areas. If you’re looking to get your dry fly fix then come on down to the last chance area and look in the flat water for rising fish. The midge hatch has been consistent. There is no point being on the water until about noon as these bugs don’t appear until the heat of the day. 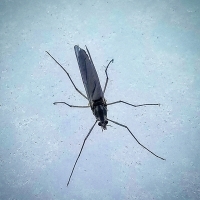 A #20 Griffith gnat will do the trick. One other spot to check is MaCreas Bridge. 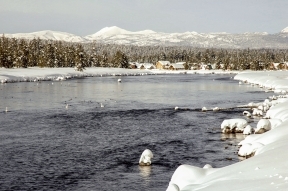 As the lake fish head up river your chance of catching truly large trout can be great on this area of the Henry’s Fork. Things on the lower river will really start heating up soon. Finding fish eating on the surface should not be an issue from here on out. It’s a great time of the year to be on the lower Henry’s Fork. I would leave the boat at home and try to hit multiple spots throughout the day. The Warm River to Ashton stretch can be amazing this time of the year. I like to drive the Fisherman’s Drive road this time of the year and look for trout rising in the multiple runs in this stretch, again you probably won’t see much in the way of surface activity until noon or a little later. Don’t let that stop you from swinging streamers or nymph fishing. If you plan on a float access is going to be an issue, not that it’s impossible but getting a drift boat out at the Ashton access is going to be a job. Person pontoons or a raft would be the way to go. As far as fly patterns go I would stick with the same stuff I have mentioned above. Black and brown #10 rubber legs and small bead heads will work well. The Ora bridge access on down to Chester and beyond will fish much the same way. If you plan on floating I would scout the take out before launching the boat. The South Fork has been fishing well. Access continues to be the only issue. You can use the Conant access as well the Byington access. Keep in mind that’s over 20 miles of water to cover and with the current flows that’s going to take all day. The current flows make wade access on the South Fork great. 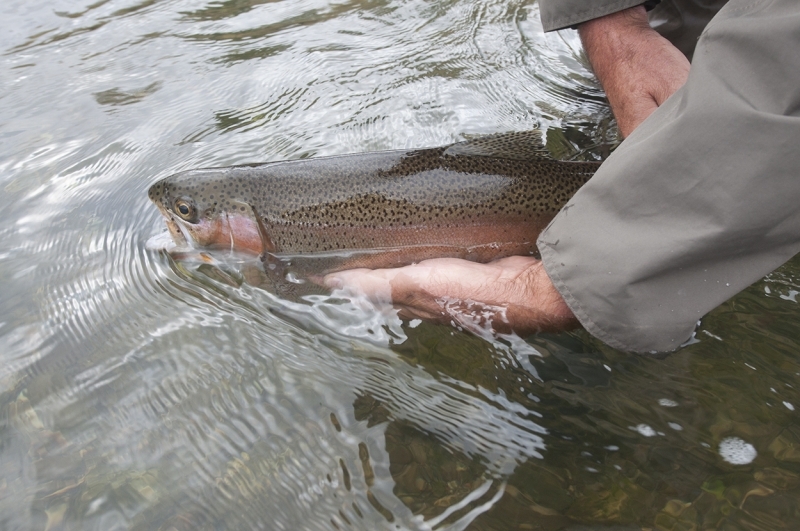 Look for large pods of cutthroat trout up eating midges. I don’t want to sound like a broken record but small bead heads and streamers will keep your rod bent on the South Fork. The Madison is one of my favorite rivers in our area to visit this time of the year. The crowds are slim and the fishing can be amazing. I fished the Madison this past weekend and had a great day. I watched Big Horn sheep grazing near the river and watched a Bald Eagle hunting along the water. The sun was out and temps were bearable and my rod was bent. What a great cure for cabin fever! The fly patterns are no different than what I have already talked about. #20 Griffiths gnat and small bead heads. I would also have brown and black rubber legs #10.